If you’re looking for modern student halls with a vibrant social atmosphere, then Okeford House might be the perfect match for you. We’re delivering accommodation for Bournemouth University, so you’ll know you’re in safe hands with us. Whether you’ve run out of milk or just fancy a drink (or two) after a busy week of studying, Winton High Street is on your doorstep, ready to cater for all your shopping and dining needs. Our accommodation is in a convenient location, meaning you’ll never be more than a 20-minute bus ride away from either university campus – a bonus when you’ve had a lie-in after pulling an all-nighter! At Okeford House in Bournemouth, our Standard Rooms come with en-suite, single bed and all-inclusive bills for your peace of mind. Find your new home today! Enjoy the privacy and independence of your own space in one of our Studio Rooms in Bournemouth. Start making memories today - your new home awaits! What types of accommodation are available in Okeford House? We understand that budget is everything for students, so we have a selection of room types to suit your bank account as well as your personality. If you go for a Standard Room, you’ll be provided with the luxury of an en-suite bathroom, single bed and study area. 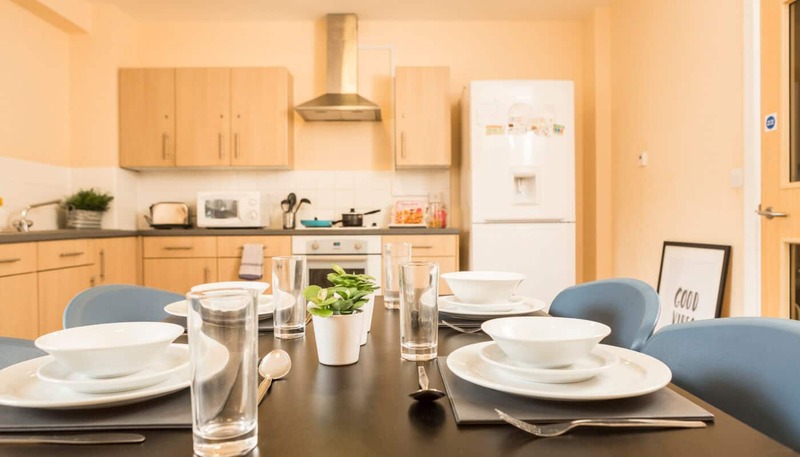 Not forgetting the shared kitchen and living area, where you can have a laugh with your new flatmates during movie night or aim to become the equivalent of Gordon Ramsay in the kitchen. If you prefer a more peaceful environment, our Studio Rooms offer the perfect balance between independence and socialising. 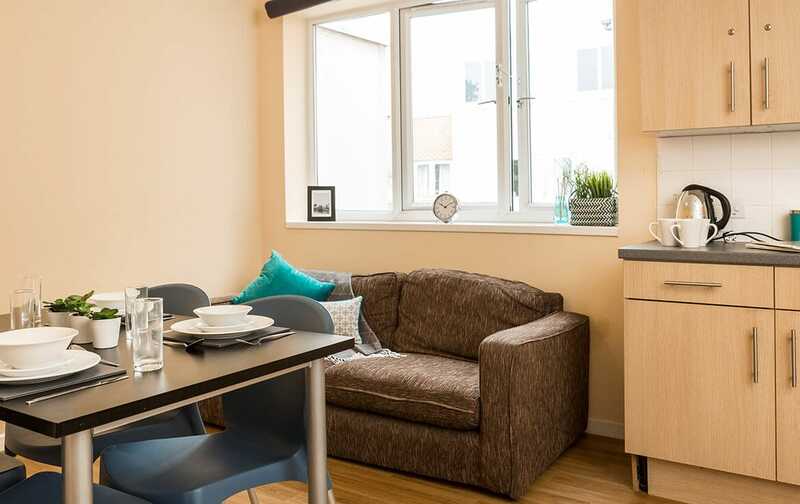 Each room comes with plenty of space to have some me-time with pizza and Netflix on a Friday night, as well as a private kitchen area, but you won’t need to feel alone – you’ll get lots of opportunities to meet your neighbours at one of the many resident life events run by your ResLifeBU team! Worried about budgeting for your water, electricity or internet costs? No need – we have you covered with our all-inclusive accommodation. Contents insurance and round-the-clock security are provided too so you can feel secure all day, every day. Due to our fantastic location, everything you need is within walking, cycling or driving distance, so you can make use of our handy bus service and bike storage, and you’ll have no excuse for neglecting your washing – our on-site laundry room is as easy as pie to use!